The RHS Chelsea Flower Show is the highlight of the British gardening calendar and the most famous gardening show in the world. Now for the first time, in a partnership between the RHS and the BBC, The Great Chelsea Garden Challenge saw six amateur garden designers compete to win the biggest prize in gardening – to design and build a garden feature on Main Avenue at the RHS Chelsea Flower Show 2015. Mentored by Joe Swift (Gardener’s World), the fledging designers had just four days and a limited budget to build show gardens in different styles – including cottage gardens, formal gardens and conceptual gardens – to try and impress RHS judge James Alexander Sinclair and Gold medal-winning garden designer Ann-Marie Powell. They were judged on how well they have met the brief, their horticultural knowledge, design skill and the sense of theatre that the garden had. The competition was filmed at gardens across the country including RHS Garden Harlow Carr, Sudeley Castle, Painswick Gardens and RHS Garden Wisley. The series started with six amateur designers and in each episode, one designer won the 'Judges Gold', while another was eliminated. Gillian, 51, lives in Gloucestershire and trained at Sandhurst as one of their first female recruits. Most recently she has worked for the Serious Organised Crime Agency, but has since undergone a career change and is pursuing a career in garden design. Gillian’s travels to Turkey inspired her first garden and her move to the Cotswolds really switched her to love seeing what can be created through nature. Jo, 41, lives in Boston Spa in West Yorkshire and is a partner in a law firm. With a strong interest in horticulture and she has done short courses in different aspects of gardening. Jo was given a shed for her 40th birthday which she loves and likes things in it be just so! Rob is 35, lives in Wilstshire and works at the Biotechnology and Biological Sciences Research Council. He had designed two gardens in previous houses where he has lived and worked in a garden at a country estate as a volunteer. Rob loves to spend time at garden shows and nurseries, and is especially interested in planting combinations. Sean, 51, lives in Northumberland and is an occupational therapist and nurse. Sean is completely self-taught and has no formal garden training. He is also a self-taught flower designer and recently passed his NAFAS (National Association of Flower Arrangement Societies) demonstrators' test. Steph, 23, lives in St Ives, Cambridgeshire and was the youngest designer in the competition. After leaving school, Steph did an English Literature degree although she knew she really wanted to work with plants, so she also enrolled in garden design course through the Open University and also did her RHS Level 2 qualification. The Great Chelsea Garden Challenge will be presented by Joe Swift pictured above with judges James Alexander Sinclair, Ann-Marie Powell and all six designers. 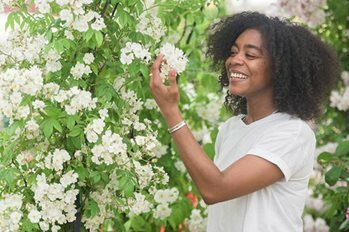 The show will broadcast on BBC Two in May and viewers will be able to follow the progress of the winner as part of the BBC’s RHS Chelsea Flower Show coverage.